Established in 2003, the museum's residency program annually honors a musical master who can be credited with contributing a large and significant body of work to the canon of American popular music. Honorees are given a blank canvas—the museum's acoustically pristine, 213-seat Ford Theater—and are encouraged to lend their own creative brushstrokes to an up-close-and-personal musical experience. Previous honorees include Cowboy Jack Clement, Earl Scruggs, Tom T. Hall, Guy Clark, Kris Kristofferson, Jerry Douglas, Vince Gill, Buddy Miller and Connie Smith. "Kenny Rogers is the consummate entertainer," said Museum Director Kyle Young. "As a member of a band or duo or as a solo artist, he has conquered the jazz, folk, pop and country worlds—not to mention his success as an actor and photographer. Kenny has the gift of telling stories and making you believe he lived them. We are thrilled that he will help us celebrate the 10th anniversary of our Artist-in-Residence program by bringing his stories and songs to the Ford Theater for two unique shows." Known for instantly identifiable, sweetly raspy vocals and an ability to vividly inhabit each song he performs, Kenny Rogers has sold more than 120 million records worldwide and recorded more than 65 albums during his storied career. He has charted a record in each of the last seven decades, including 12 #1 albums. His long list of hits includes 21 #1 songs, among them "The Gambler," "Lady," "Lucille," "Coward of the County," "She Believes in Me," "Islands in the Stream" (with Dolly Parton) and "Every Time Two Fools Collide" (with Dottie West). Two of Rogers' albums, The Gamblerand Kenny, are featured in the About.com poll of "The 200 Most Influential Country Albums Ever," and his Greatest Hitsalbum has sold over 24 million copies worldwide. He is the RIAA's eighth best-selling male artist of all time with one diamond album, 19 platinum albums and 31 gold albums. He has earned three Grammy awards, five Country Music Association awards and eight Academy of Country Music awards including Entertainer of the Year in 1978. Rogers still tours and records new music. Born in Houston,Kenny Rogers formed his first band while in high school in 1956. The rockabilly group, the Scholars, got a record deal and released two singles. "That Crazy Feeling," a solo record by Kenny released as Kenneth Rogers on Kix Records in 1957(and picked up by Carlton Records in 1958) led to a performance on American Bandstand. Soon afterward, Rogers joined the Bobby Doyle Three, playing stand-up bass in the jazz band, and appearing on their Columbia Records album. In 1966 he became a member of popular folk group theNew Christy Minstrels, leaving a year later to form the First Edition with New Christy Minstrels bandmateMike Settle and Thelma Camacho, Mickey Jones and Terry Williams. The group signed with Reprise Records. Their first hit, Mickey Newbury's psychedelic "Just Dropped In (To See What Condition My Condition Was In)," went to #5 on the BillboardHot 100 chart. After a few more tries at chart success, the band billed themselves as Kenny Rogers and the First Edition. They released "Ruby (Don't Take Your Love to Town)," written by future Country Music Hall of Fame member Mel Tillis. "Ruby" was a pop and country crossover hit and broke the Top 10 in 1969. They enjoyeddouble-genre popularityagain with "Ruben James." For the next couple of years, Kenny Rogers and the First Edition enjoyed mild Top 40 success. From 1971–73, the band hosted their own TV series, Rollin' on the River. The rock, blues and folk-oriented variety show included musical guests such as Jim Croce, Bo Diddley, Ronnie Hawkins and Ike and Tina Turner. By the mid-1970s, the First Edition had run its course, and its members, ready to pursue solo careers, parted ways. Rogers began his solo career at United Artists Records. After a string of modest hits, he struck country gold with the heartbreaking single "Lucille" from his self-titled album. The 1977 Grammy-winning song topped the country charts, reached the Top Five on the pop charts, and was named the CMA Single of the Year. "Lucille" was followed by "Daytime Friends," "Sweet Music Man" and "Love or Something Like It." Rogers' next album, named for a song about a down-and-out drifter with advice for a weary traveler, was released in 1978. "The Gambler," written by a then-unknown songwriter named Don Schlitz, would become Rogers' career song and spawn five TV movies starring Rogers as ‘The Gambler.' The song spurred him to a 1979 Best Male Country Vocal Performance Grammy award and to 1979 CMA Album of the Year (The Gambler) and Male Vocalist of the Year honors.The five Gamblermini-series, which attracted over 100 million viewers nationwide, also started Rogers on a second career as an actor on television andinmovies, including aTV movie based on anotherof his #1 hit songs, "Coward of the County." Rogers' run of chart smashes continued with "She Believes in Me" (1979), "Coward of the County" (1979) and the Lionel Richie ballad "Lady" (1980). "Lady" was a #1 country hit and a pop crossover sensation, spending six weeks atop the pop charts. His 1980 hit "Love the World Away" appeared on the Urban Cowboy soundtrack. Known almost as well for his duets as his solo works, Rogers continually topped the charts in the 1970s and '80s with his collaborations. He recorded a string of hits with frequent partner Dottie West, including "Every Time Two Fools Collide" (1978), "All I Ever Need Is You" (1979)and "What Are We Doin' in Love" (1981). The pair won Vocal Duo of the Year at the 1978 and 1979 CMA Awards. Rogers recorded "Don't Fall in Love with a Dreamer" with his fellow New Christy Minstrels alum Kim Carnes in 1980. In 1983, he partnered with Dolly Parton for one of the most popular duets in music history: "Islands in the Stream" earned them ACM Single and Top Vocal Duo awards that year. In 1985, Rogers participated in the historic recording of "We Are the World," the multi-celebrity performance which raised millions of dollars for famine relief in Africa. A year later, he co-chaired the "Hands Across America" fund-raiser for America's hungry. By the end of the 1980s, pop and country music had begun to change, and Rogers' chart success began to ebb. "Tomb of the Unknown Love" (1986) and "Make No Mistake, She's Mine" (1987), a duet with Ronnie Milsap, were Rogers' last chart toppers for more than a decade. Through the late 1980s and early '90s, Rogers revealed himself to be a man of many interests. He proved to be a gifted photographer with the publication of several photography books, andwas even invited to the White House to shoot a portrait of First Lady Hillary Clinton. He also authored several short stories, and appeared off-Broadway in his Christmas musical, The Toy Shoppe,which he subsequently toured. After forming his own record company, Dreamcatcher Entertainment, in the late 1990s, Rogers returned to the country charts with "The Greatest," another Schlitz-penned tune. The follow-up, "Buy Me a Rose," went to #1 in 2000. Rogers proved he was still relevant to 21st century country music with his critically acclaimed Water & Bridges (Capitol Nashville, 2006), which included the single "I Can't Unlove You." Produced by Dann Huff (Keith Urban, Faith Hill), the album put Rogers back on the charts and further solidifiedhis significance and long-term viability in the music world. 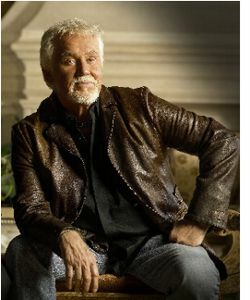 In 2010, Rogers celebrated his 50th anniversary in music by taping the star-studded television special Kenny Rogers: The First 50 Years,which aired on the Great American CountryTelevision Network(GAC). In March 2011, Rogers released his first gospel album, The Love of God. The acclaimed release became his 21st Top 10 country album. He is beginning work on a new album and finishing his autobiography, scheduled for release later this year. A limited number of Kenny Rogers residency event tickets can be purchased by museum members at a discounted rate of $40 per show beginning Tuesday, April 3, at 10:00 a.m. by visiting www.countrymusichalloffame.org. (A one-year museum membership is $40.) Tickets will go on sale for $50 per show to the general public at 10:00 a.m. on Thursday, April 5, and can be purchased at www.countrymusichalloffame.org. Tickets sales, limited to four tickets per show, are available on a first come, first served basis and are non-refundable. Additionally, the Pinnacle at Symphony Place garage is offering attendees an $8 parking option on each of the performance evenings. Museum doors open at 5:30 p.m. for the 7:00 p.m. shows. In addition, the museum's galleries will be open to all ticket holders prior to each performance, beginning at 5:30 p.m., as will the museum's Two Twenty-Two 2Go bar, serving a variety of food and beverages. The 2012 Artist-in-Residence program is made possible, in part, by RJ Young. Additional support is provided by grants from the Metropolitan Nashville Arts Commission and by an agreement between the Tennessee Arts Commission and the National Endowment for the Arts.